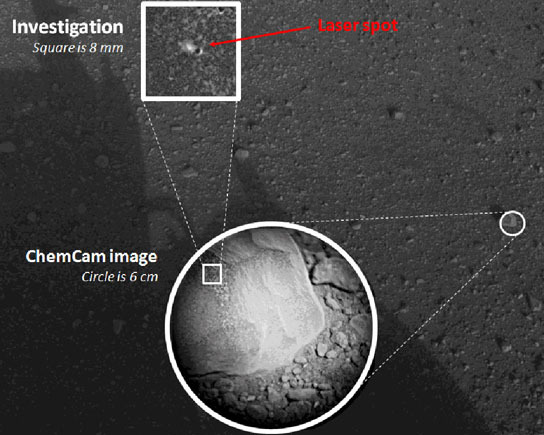 NASA’s Curiosity rover fired its Chemistry and Camera instrument laser for the first time, hitting a fist-sized rock with 30 pulses of its laser during a 10-second period and recording spectra from the laser-induced spark at each of the 30 pulses. The technique used by ChemCam, called laser-induced breakdown spectroscopy, has been used to determine composition of targets in other extreme environments, such as inside nuclear reactors and on the sea floor, and has had experimental applications in environmental monitoring and cancer detection. Today’s investigation of Coronation is the first use of the technique in interplanetary exploration. ChemCam was developed, built and tested by the U.S. Department of Energy’s Los Alamos National Laboratory in partnership with scientists and engineers funded by the French national space agency, Centre National d’Etudes Spatiales (CNES) and research agency, Centre National de la Recherche Scientifique (CNRS). NASA’s Jet Propulsion Laboratory, a division of the California Institute of Technology, Pasadena, manages the Mars Science Laboratory Project, including Curiosity, for NASA’s Science Mission Directorate, Washington. JPL designed and built the rover. 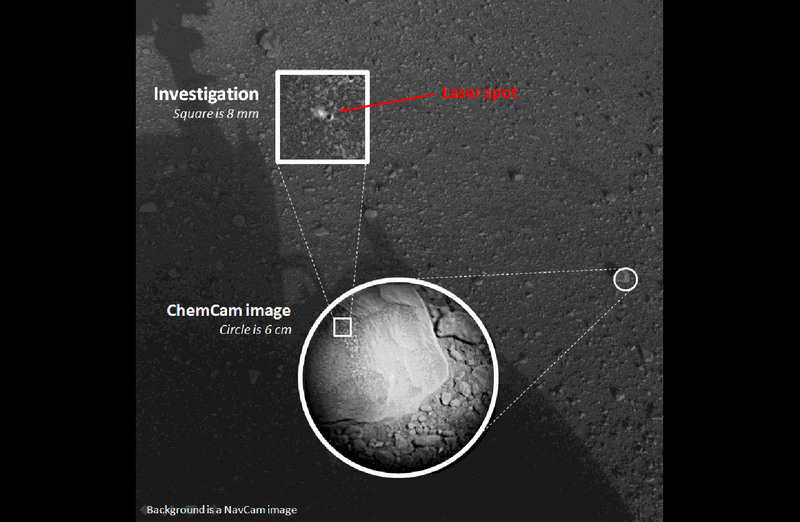 Be the first to comment on "Curiosity’s ChemCam Laser Analyzes its First Martian Rock"